There is some confusion with crafting experience. The game refers to crafting experience as Inspiration Points not Experience. When you turn in writs, you receive adventuring experience points and crafting inspiration points (shown above the gold reward). Where do you see your inspiration? To view it, bring up the abilities screen and navigate to the crafting profession you are interested in (enchanting shown here) and hover the mouse cursor over the Rank bar. 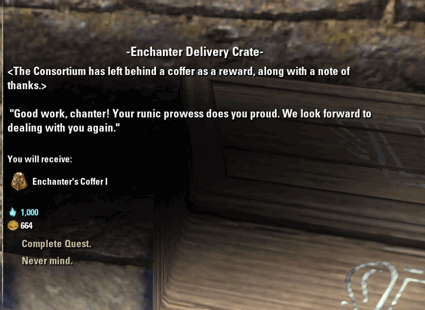 Ever wonder if the writs you turn in get the bonuses from your Champion Points and ESO+? The answer is yes but it doesn’t show the modified number in your quest rewards. It will show the default value. In this screenshot, the Inspiration is 1,000 .